Among the first generation of rock acts The Treniers elevated the visibility of the style in the mainstream maybe more than any other in the pre-crossover days, yet because of how they accomplished this they’ve gotten little respect for their efforts. Rock historians haven’t exactly been kind to so-called novelty artists or records. There’s begrudging respect for the heavyweights of the division, The Coasters, but that may be more because their material was penned and produced by Jerry Leiber and Mike Stoller, two immortals who are deservedly near the top of every great rock songwriters list and who by no means confined themselves to the comedic playlets that propelled The Coasters to stardom. But as for the rest of rock, particularly after the mid-1960’s when a generation of literary minded critics began writing about music with the utmost seriousness usually reserved for theologian studies, the humorous style which had been a steady presence in rock’s first two decades began to lose its cachet. There’d still be those who poke fun at a good many things within their songs but generally those who relied on it too much were shunned by the rock journalists, as any act who dared bring some levity to the proceedings found themselves jettisoned to the gimmick corral and routinely mocked when injected into discussions of “important artists”. The Treniers are among those who’ve had their legacy largely eradicated from the story of rock’s rise to prominence as a result of this, or if they find themselves marginally included the focus has tended to be more on their influential and highly visual stage show, a model for Bill Haley’s Comets among others, and not on their music itself. Now to be fair The Treniers WERE aiming at a rather different type of success all along. They were primarily a club act who also made records and as such their focus… and subsequently their appeal… was for their live shows where they combined music, acrobatics, shameless grandstanding and a good deal of humor to connect with audiences – all audiences, not just rock, though that is unquestionably where their musical DNA was firmly located. It was because of this unique style and showmanship however that The Treniers were able to consistently break down doors for rock before most others. They were among the first rockers to appear in Las Vegas, as well as on TV, notably on Jerry Lewis & Dean Martin’s program, precisely because their music could be considered secondary to their antics and those antics on their own had appeal to a much broader audience than the music would’ve at the time. For other rockers in the early 50’s, no matter how vibrant their own stage act may have been, it wouldn’t have taken precedent over their music, and so once their music was deemed unacceptable for airing so too was any shot the artist had to be seen on the airwaves. Not so for The Treniers. As long as you could simply read their material as a joke, not as something even they were taking seriously, though they certainly were taking it seriously, they were deemed okay. In effect they were the Trojan Horse of rock acts, slipping past society’s defenses under a guise of satire only to spring forth with the music once they had gotten inside. But to call The Treniers nothing more than a novelty act does them a huge disservice. Though they could clown their way through a show and deliver laughs on record, they could also play and sing with the best of them and would’ve likely been as popular with rock audiences for their records alone, even without the curiosity factor that allowed them to draw in adults through different mediums along the way. After that build-up defending their overall musical merits it’s a little humbling to then introduce you to The Trenier Twins (as they were still called before two more brothers joined the already established Cliff and Claude) in what can only be called a pure novelty record. Oh well, I never claimed they didn’t do them, only that they did more than just those. For those who are card carrying members of the “serious literary minded rock critic society”, it may help your appreciation of the record to know that theirs was not the original version of Hey Sister Lucy. Jesse Stone, one of the most important songwriters in rock history, the man who Atlantic Records founder Ahmet Ertegun claimed did more to create the basic rock songwriting template than any other figure in history, was both its author and original performer just a month earlier. Stone was already a veteran presence in music in a variety of styles dating back to the 1920’s but wasn’t yet aboard the rock bandwagon as it pulled out of the station, so his version has a more old-fashioned musical framework than the types of songs he’d wind up immortalizing down the road. The Treniers however saw the song as merely a starting point for a comedy skit set to music. Though they may have wanted you grooving along the beat they’d be let down if you didn’t break your stride to double over in laughter along the way. You don’t quite do so, but it’s not for lack of trying on their part. To start with, everything is exaggerated from Stone’s version. In the original the lyrics are the focal point of the comedy while Stone’s performance itself maintains a bit more dignity in the telling of it. He’s certainly flustered by her attributes but he comes off as if he’s telling his buddies down at the barbershop and it’s his colorful descriptions that are getting the laughs more than Stone’s delivery. The Treniers by contrast are focused far more on the delivery than the words themselves, making theirs more “performance art” than merely a novelty record, as they’re essentially poking fun at the characters they play here, portraying the entire affair as much sillier than what was written. They make the welcome addition of having the girl in question an active participant in the proceedings, as Cliff Trenier takes on the role of a female responsorial voice to Claude delivering the main lines critiquing her anatomy. Cliff’s ad-libs are the highlight of the first half, as his/her snide condescending replies give the humor most of its bite. For it’s one thing to make fun of something in the abstract but quite another to have the subject get “her” two cents in as well and thus what Stone’s was lacking is exactly what helps to put this version over a little better at first. Their timing on this section is impeccable and Claude’s vocals take on all of the right tonal nuances to make it work. Singing at times, speaking at others, drawing out words to increase the humor and cutting short others for the same purpose, this shows why The Treniers lasted for as long as they did, both brothers had their roles down pat and played them to perfection. However those that giveth also taketh away and here the Treniers make the crucial mistake of eliminating much of Stone’s lyrics from the second half of the song where Jesse had expounded on her sizable protuberances in a series of ridiculous anecdotes about eating gravy, kissing and applying lipstick. That’s where Stone’s version got much funnier, whereas The Treniers version starts to falter down the stretch as Cliff’s part is mostly done away with in the latter half. Claude is left to simply repeat the chorus without any new retorts to keep things lively and so it becomes too reliant on the musical aspects of it which are merely pleasant at best. There are no slamming drums or subtle rim-shots to drive home a joke, no suggestive saxophone retorts and the piano break which makes up the main accompaniment is rather dull. It’s almost as if halfway through they decided to play it straight and the only moment that stands out from here on in is when the two harmonize on a single line, showing that they were underrated as pure vocalists. That they had the required material with which to work – and even build upon – from the midway point on and chose to discard it altogether makes the record far too schizophrenic to fully succeed. On one hand theirs is more of a novelty in terms of the framework than Stone’s version, yet the subdued ending winds up turning it into more of a standard song than the original and that’s just not going to work well considering the nature of the material. The end result is more interesting than it is effective, a failed experiment, albeit one worth exploring down the road with a little more fine-tuning. I suppose it’s easy now to see that circumstance played a part in it falling short conceptually, at least to a degree. By rushing into the studio so quickly to cover the song as soon as it came out they hadn’t had time enough to fully work out a routine. I’d imagine that as they honed this over the next month or two in live gigs it probably went over a lot better, not just because you can certainly envision her physically belting him for his wisecracks on stage, letting the whole thing dissolve into mayhem, but also because they’d have no choice but to expand on the jokes – and thus the lyrics – to keep it going. In that setting it might’ve been really special. As a record though, while it shows early promise it fizzles out too quickly and even though they deserve credit for introducing the novelty concept to rock and at times deliver a first rate acting job in the process, the components are still a bit off. 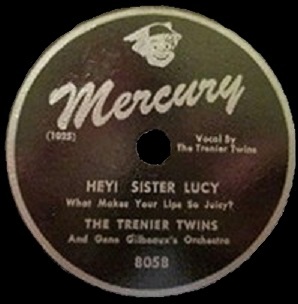 Leave a reply on "The Trenier Twins: “Hey Sister Lucy”"